They can do that because the very law that legalized abortion nearly 40 years ago also exempts medical personnel from providing the procedure if “they have a conscientious objection, declared in advance.” More and more conscientious objectors — many of them Catholic — have joined gynecological wards, women’s clinics and pharmacies since, and as a result getting an abortion in Italy today can be as hard as in countries where abortions are illegal. Some 20,000 unsafe and illegal abortions are said to be performed in Italy every year, compared with about 100,000 legal ones. The number of illegal procedures is increasing, advocates for women’s rights say, even as the number of legal ones is decreasing. According to 2015 figures from the health ministry, the most recent available, less than 60 percent of public hospitals in Italy even provided abortions. Earlier this year, one woman in Padua, a city in the northeast, had to go to 23 hospitals before she found one that would terminate her pregnancy. For this, Italy has been repeatedly chastised by the Council of Europeand the United Nations Human Rights Committee. The government has responded demurely, at times claiming that the number of medical personnel who are not conscientious objectors has remained steady for 30 years. A pitched battle certainly now seems to be underway — in hospitals and on the streets, in local assemblies and courts throughout the country. Almost as soon as Law 194 was passed in 1978, the Church and its political proxy then, the Christian Democratic Party, tried to have it repealed. A referendum was held in 1981, but voters rejected the idea — roundly, by a margin of 2 to 1. Having failed to change the law, the Church then set out to exploit its internal contradictions — which it had helped create. Four decades later, it’s apparent who has benefited from that weakness, and this result is no accident. Pope Francis himself, speaking at a gathering of Italian Catholic physicians in 2014, encouraged doctors to make “brave choices that go against the current,” referring pointedly to conscientious objection and abortion. Although the Christian Democrats are no longer, Catholicism remains a major political force. The religious movement Comunione e Liberazione (Communion and Liberation), whose stated mission is to promote the “education to the Christian faith” and comes under the pope’s direct authority, has thousands of supporters — some say many thousands — including in hospitals, universities and women’s clinics, and among politicians in center-right parties, like those who opposed Mr. Borraccino’s law in Apulia. In addition to legalizing abortion, Law 194 called for establishing specialized women’s clinics. 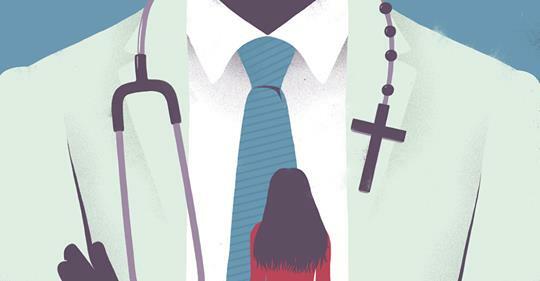 But after years of cuts to the state health care system, many clinics today are Catholic, and those refuse to provide even information or basic services to women seeking an abortion. What’s more, they are partly funded with taxpayer money: 0.8 percent of personal taxes are directly allocated to the Church, unless taxpayers specifically ask to opt out. So much for the separation of Church and state. Opinion polls suggest that the vast majority of Italians still support access to abortion. But some three-quarters of the population also call themselves Catholic, and so even for some Italians who support women’s right to terminate a pregnancy, abortion still carries a stigma. And that’s just the kind of tension that the Church has been expert at exploiting — at a great cost to women, as well as the rule of law, in Italy.